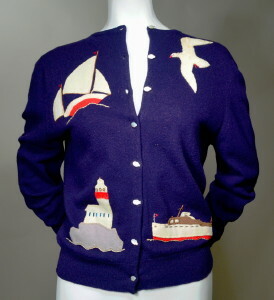 50's vintage sea side motif BRAEMAR cashmere cardigan sweater. Navy blue cashmere sweater with red, ivory, gray and brown wool and ivory plush. Ribbed jewel neckline, waistband and cuffs. Hand appliqued Sail boat, light house, seagull and cabin cruiser, each with beaded accents. Sea shell applied to left sleeve and seagull at back. Tiny carved white mother-of-pearl fish motif buttons (8). Button placket faced with grosgrain ribbon. Soooo soft cashmere sweater. When not in use, why not hang as charming home decor? HAMPTONS anyone? Shoulder, measured from seam to seam across back yoke - 15"
Sleeve length, measured from seam to cuff fold - 23"
Length, measured from neckline edge to hem edge - 21"
EXCELLENT condition. Shows slight wear throughout. Gulls show light soil discolor and wear to plush nap. 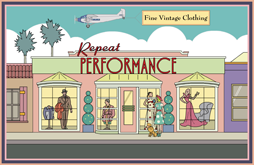 Generally in great condition!